Hot Spots: Earth’s 5 Most Naturally Radioactive Places | WebEcoist. A Sane and Sober Look at the USS Reagan Radiation Contamination Incident. Indoor Radon Levels and Lung Cancer Incidence on Guam. Radon (Rn) is a naturally occurring, radioactive gas that impacts air quality world-wide. It is a known carcinogen and considered by the United States Environmental Protection Agency (U.S. EPA) to be the second leading cause of lung cancer after tobacco smoking. Of several known isotopes of radon, 222Rn is the most stable with a half-life of approximately four days. This particular isotope is associated with the uranium (238U) decay series and accounts for most public ionizing radiation exposures. Most global indoor 222Rn emanates from granitic bedrocks located underneath buildings. While such rocks are absent on Guam, the karst limestone formations that overlay the island’s basement volcanics (basalt) are of biogenic origin and are believed to be a significant source of radon. In a recent multi-year survey conducted on Guam by the local EPA, indoor 222Rn levels exceeded the U.S. EPA air quality standard of 4 pCi/L in ~40% of all buildings tested. Concentrations were log-normally distributed and exceeded 300 pCi/L in two instances. Weighted average indoor 222Rn levels were generally much higher in villages from the northern half of the island where limestone coverage predominates. The relationship between 222Rn and lung cancer incidence on Guam was examined in the study reported here. The results were strongly suggestive of a hormetic effect existing between the two variables. Possible confounding effects attributable to smoking and ethnicity were examined and found to be insignificant. In fact, ethnic groups predominantly confined to the northern half of the island (i.e., Filipinos and all other Asians as a collective group) showed considerably lower cancer incidence and mortality rates than the indigenous Chamorro people who are well represented island-wide. The findings of the study lend further weight to numerous other reports that suggest low-level exposures to 222Rn have a beneficial health effect. They also support a growing critique of the rationale behind the U.S. EPA adopted linear-no-threshold toxicological model, which assumes that any dose of radiation is harmful, no matter how small. Finally, they also imply that the current U.S. EPA action level of 4 pCi/L for indoor radon is overly conservative and needlessly prompting homeowners to install radon mitigation systems into buildings that really don’t need them. The 25 Best Nerd Road Trips | Popular Science. 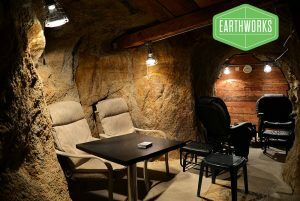 Boulder, Montana N 46.271749 / W 112.154152 Visitors to this former uranium mine pay to sit in lounge chairs 85 feet belowground and breathe the radon gas seeping from the tunnel’s rock walls. The facility, founded in 1952, is one of four radon-therapy sites in the U.S., all in Montana. Philadelphia Inquirer article on “Scientists study using low-dose radiation” – radon.gal@gmail.com – Gmail. FYI: Recently a reporter from our local newspaper Philadelphia Inquirer interviewed me over phone for about an hour talking about my work in the area of low dose radiation. I was somewhat apprehensive about what may be in the article she was about to write, as I have observed sometimes that such articles in popular media have inaccuracies that detract from the story.Her article appeared yesterday in the newspaper with the title “Scientists study using low-dose radiation” available at the link: http://articles.philly.com/2013-09-08/news/41876116_1_radiation-exposure-low-dose-radiation-ionizing-radiation. Though the article has a few technical inaccuracies in details, it is indeed correct in the overall message it conveys about the current state of the art in this area, in my opinion. The conclusion of the article regarding low dose radiation is ambiguous and unclear because of dismissive statements of “experts”, not data. Certainly the overall message is more realistic than the usual ones appearing in popular media about the risk of cancer from low dose radiation, e.g. from CT scans. Hence, I am pleased with the article, though I would have phrased it somewhat differently. Underground Gallery: Daily, 9 a.m. to 4 p.m.
Office Hours: Daily, 9 a.m. to 2 p.m.
(All information subject to change).